Our experienced terrazzo technicians can deliver a natural finish that will result in long lasting luster using the more preferred processes similar to those used for natural stone restoration — no coatings required. And, follow up cleaning is so much easier than maintaining your terrazzo floors with topical treatments. No more stripping and waxing! Just a quick sweep and a damp mop. Any flooring subject to high-traffic can quickly lose its appeal and become dull, scratched, and dirty-looking. Terrazzo is no exception. A common method of maintaining the shine on terrazzo floors is to use topical coatings (waxes), but this results in higher maintenance costs and less appealing results. Why? Because the shine from wax and strip polishing only lasts a short while, and this method generally ends up doing more harm than good. Coatings become scratched and scuffed, and dirt, grime, and other contaminants become embedded in them, making the floor ugly and unsanitary. To keep the floor looking nice, the coatings have to be completely removed and replaced as often as every three months. Sometimes the coatings are not completely removed, and with each passing strip-and-wax, the floor gets a new layer of … well, yuck. 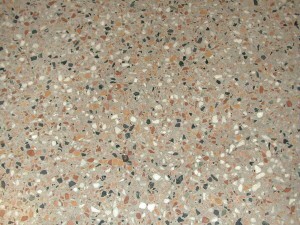 Terrazzo is a unique stone finish that usually contains marble chips of different sizes and colors and it is held together with a cement base or in newer application held together with a resin or epoxy base. Terrazzo can be polished using a natural polishing process that eliminates the need to strip off the old wax finishes and can actually reduce the maintenance cost. When terrazzo is finished naturally you can achieve a gloss or matte finish. Marble Plus Floor Care can restore, re-polish and repair your terrazzo floors, walls or counters. Using the proper cleaners and care products will keep your terrazzo looking like new with minimum maintenance. Give us a call today at (561) 641-4505 for a FREE estimate on your terrazzo cleaning, polishing, repair, maintenance, and restoration needs throughout the throughout the Palm Beach, Boca Raton, and Ft. Lauderdale area. We look forward to serving you!